A romantic getaway deserves more than 48 hours. This four-day, three-night itinerary is full of experiences that will allow you to relax, restore and reconnect in California&apos;s most romantic destination. You&apos;re staying at the hotel that has claimed the "Most Romantic in the U.S." title from TripAdvisor two years in a row. Spindrift Inn is in the center of Cannery Row, yet manages to create the sense that you and your partner have stepped into a timeless world of your own. Your oceanview room has a wood-burning fireplace, feather bedding and breakfast delivered to your room every morning. Due to the vagaries of Monterey Bay geography, you can&apos;t watch the sun set from your window. But you can watch it set from the spot named "Best Place to Watch the Sunset" by the Monterey County Weekly - Carmel Beach. Perhaps the beautiful sunset is why the website Smarter Travel named Carmel-by-the-Sea the Best Beach Town for Romance. Make like the locals, and bring wine with you to sip as the sun goes down. Crank up the romance of the sunset by snuggling next to a beach fire. You could build one yourself, but it&apos;s more romantic to surprise your love with one that&apos;s already been created. (Plus, you&apos;ll be sure to be in compliance with local laws.) Romantic Room Designs will set up a beach fire, complete with a blanket to snuggle in, rose petals spelling out "I Love U" and all the fixin&apos;s for smores. Tonight you&apos;ll eat at the restaurant acclaimed by many sources as the most romantic in Monterey County, Casanova. Stepping up to this French/Italian hybrid is like stepping across the Atlantic into Provence. The food is delectable, and the venue has plenty of nooks and crannies where you and your partner can feel like you&apos;re in your own private world. Wake up, remember that you&apos;re on a romantic escape, snuggle up to your partner, and go back to sleep. Once you&apos;ve enjoyed breakfast in bed, stroll down to romantically named Lovers Point for a kayak tour for two with Adventures by the Sea. Take turns paddling along the Monterey Bay coastline spotting otters, sea lions, and possibly even some dolphins. Fandango Restaurant is quite the European gem of Pacific Grove. Step inside and you&apos;ll be transported to a romantic, whimsical Northern Italian bistro, complete with delicious Mediterranean entrees on your plate. Vista Blue Spa, just a few short blocks from your hotel at the top of the Monterey Plaza Hotel and Spa, is the only spa in Monterey to make Travel & Leisure&apos;s elite World&apos;s Best list. Book the Bubbly Package and enjoy a couple&apos;s bath accompanied by champagne and chocolate-dipped strawberries, followed by a couple&apos;s massage. Then adjourn to the rooftop sun deck to cuddle by the fireplace or soak in the hot tub with a sweeping view of Monterey Bay. Head to Lucia Restaurant & Bar at Bernardus Lodge for a romantic meal to remember. The scenic drive to Carmel Valley will put you in the right frame of mind for dining at this restaurant, nestled among vineyards. Chef Cal Stamenov focuses on local produce; many of the herbs on your plate were grown by Stamenov himself. Take a Wine Trolley tour with and indulge in a mix of sightseeing and wine tasting. The tour begins at the Portola Plaza in downtown Monterey with stops at Ventana Vineyards and various tasting rooms in Carmel Valley including Cima Collina, Joyce Vineyards and Bernardus. Sail into a romantic evening with a sunset dinner cruise from Monterey Bay Sailing. The Captain is both a wonderful sailor and a dab hand at the grill. Kick back, sip wine, and enjoy another magnificent sunset. You could take a taxi back to your hotel, but why bother when you can take a romantic moonlit stroll along Monterey Harbor? At this time of night, the typical throngs of cyclists and walkers on the Monterey Bay Coastal Recreation Trail have slowed to a few meandering romantic couples, like you. The trail will lead you straight from the Wharf to within a half-block of your hotel door. 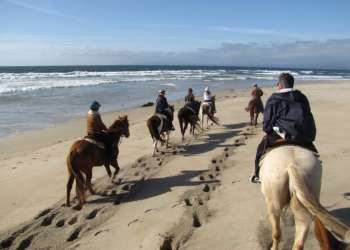 Enjoy views of Monterey&apos;s romantic bay as you take a horseback ride for two along the beach. Whether you&apos;re a master rider or a beginner, Monterey Bay Equestrian Center will pick out the perfect horse for you. If you&apos;re heading home via the airport, enjoy the last hour of your romantic escape with lunch at the historic stone Tarpy&apos;s Roadhouse. If you&apos;re ending your getaway with a scenic drive south along California&apos;s coast, stop at the Restaurant at Ventana, nestled in the heart of Big Sur, for a meal at one of Open Table&apos;s top picks for romance. Heading north? Ease into the real world with a stop at the intimate Haute Enchilada for Peruvian, Cuban and French spins on fresh seafood.